WHAT'S YOUR GO-TO COLOR? Color can be a daunting word especially when one is faced with a wall of swatches at the local paint store. Our aim isn't to overwhelm you with color combinations. We've created this 'Neutrals' color guide to educate and encourage you to embrace hues in your own home by pairing elements from your collection with those from ours. In the pages that follow, we show examples of neutral settings, explain our reasoning for each pairing and possibly suggest other options to consider. To keep things simple, we have chosen to present three basic lookbooks which feature colors grouped together by category. Neutrals (this one), bold colors that include jewel tones as well as neons, and pastels that swing from soft, warm pink to to subtle, cool green. Okay, technically white, grays and black aren't colors, so we call those neutrals to which we also add browns. Another note about neutrals, they can and do work well on their own and they can and do blend well with other hues, so don't be surprised when you see them breaking out of their own category here and there. This is our first in a series of color idea look books. We hope you find helpful information and inspiring combinations that you can use in your quest for living beautifully and harmoniously with your soul. Live, Love & Laugh Beautifully. Not so neutral A brillant way to maintain vibrancy in an otherwise neutral bedroom is to combine textural elements. Textural elements can be felt and often seen when the light touches them in just the right way. Matouk Piazza bed combines neutral hues with a quilted coverlet that dances with the light - an excellent way to add texture. Choose Iosis's Zig Zag decorative pillow in opale to add to this neutral bed. Piazza quilted coverlet in charcoal creates a second highly textural chevron element when combined with LuLu DK's Harlow. This neutral and eyecatching ensemble can be more so with Iosis's Zig Zag decorative pillow in ardoise. If solid sheets in most any hue are too subdued for your taste, may we suggest choosing items with an applique trim or an attached hem to the top sheet and cases. For an all-white bed enjoy Peacock Alley's Giovanni. Combined with Overture's scallop-flange shams, the curved, fanshaped design in this matelasse is validated and accentuated. Add Captiva decorative pillow and throw to complete the look. Create drama, excitement and depth in a neutral bedroom by pairing two or more complimentary fabric designs. A mix of organic patterns from the same hue can be quite elegant. Include a geometric for more excitement. Schlossberg's Rosaria (top left), a sateen floral print, is shown paired with solid sheets. For additional depth, add Yves Delorme's Italics decorative pillow and a throw Matouk's Arcadia in bronze/white or Pine Cone Hill's open-weave Lacey, for example. Move by Schlossberg in neutral galet color is an energetic, modern, organic pattern. Pair Move with Yves Delorme's Italics decorative pillows and a subdued solid color throw such as Sferra's cashmere Dorsey in ivory, almond or champagne for a designer look. Decorative pillows can add more than whimsy. By selecting one or more in a room to compliment or contrast with items you already have help to carry the eye throughout the space. Examples shown here can certaintly add the right amount of sophistication. Peacock Alley Lucia and Preston and Iosis Zig Zag. Sferra Francesca and Sweet William combine solid percale sheeting with delicate floral embroidery. To preserve hints of the detailed embroidery pattern, pair shams and duvet cover with a white soft-textured coverlet such as Cestino by Matouk and a white woven knit decorative pillow such as Majorca by Peacock Alley. Embellishments Brillant ways to create interest and drama in a neutral bedroom are to introduce textural elements such as lace and embroidery or a fabric with high and low sheen. Stir it up! Yes, white and ivory can be used together and look fabulous. Even gray and cream can be eyecatching. Take an ivory bed like Lugano below and imagine layering on any one of the decorative pillows to the right or the neutral silver-sage or camel bedding above. For a truly clean bed, most any neutral coverlet such as Matouk's Lugano is key. By incorporating a white or another neutral color throw and a decorative pillow or two into the mix, your clean bed just went from blah to inspiring with little fuss. Sferra's Presidio bed is shown in a tone-on-tone mix called silver/sage where lighting can and does play a role in its color intensity. Thus, we suggest pairing this collection with a white coverlet and shams such as Peacock Alley's Allyse or Sferra's Bari in gray and Peacock Alley's nature-inspired Oliver decorative pillow in platinum. When paired with a single, appliqued wide-stripe top sheet and standard cases in coordinating colors, a caramel colored Leon jacquard duvet cover and shams create just enough texture to make a lovely presentation. Choosing a decorative pillow such as Parker or the more daring Fabiana faux fur pillow and throw, both by Peacock Alley, could make your room ever-so-inviting. As noted, there are other ways to convey bedroom drama without bright colors and lively entertainment. Tonal patterns and neutral hues along with a mixture of textures are great alternatives to set the right mood. natural. comfortable. home. DEWOOLFSON LINENS 9 45 2 N C H i g h w a y 1 0 5 S . B a n ner E l k, NC 2 86 0 4 U. S . A . © 2 014 DE WO OL F S ON D OW N I N T ’ L ., I NC . 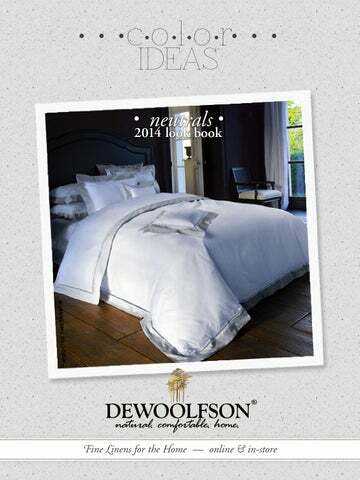 Preview the latest fine bed linens in a neutral color palette at DEWOOLFSON.